I'm on this panel with some of the smartest people I know! Check it out November 23rd. "While the wealthy dance and drink fine wine in a futuristic playground, working people suffer on the outskirts -- hungry, heavily policed, and struggling to secure basic subsistence. Once there was the chance for revolution, but now it’s a distant memory, a discarded hope kept at bay by brutal police, aching poverty, and the separation of working people into small segregated areas afraid or unable to talk to each other in a meaningful way. Is this Panem of The Hunger Games, or the America of 2014? Questions of whether The Hunger Games belongs to the “left” or “right” typically inhabit the same old partisan sideshow where answers are determined in advance and politics is a matter of arguing opinions. This is not the domain of revolution, which in 2014 must be the site of unanswered questions and argumentation by action. 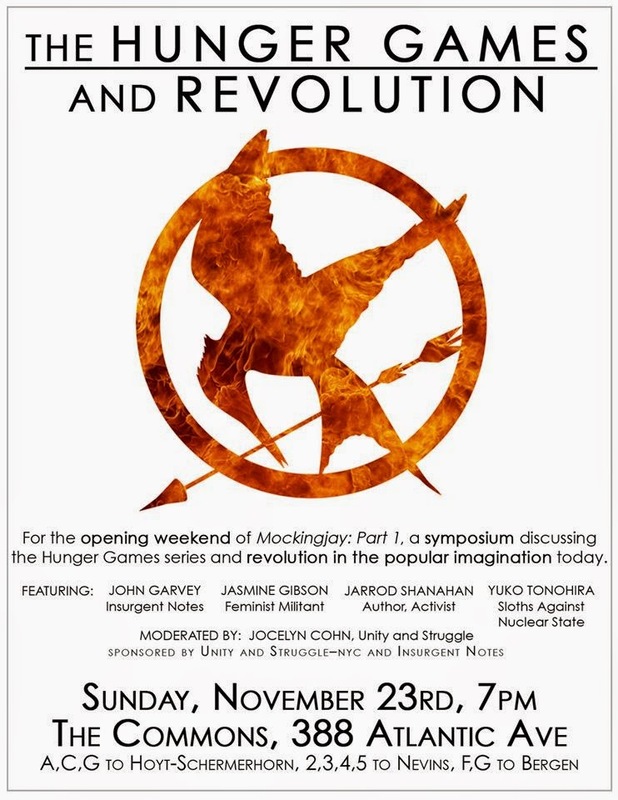 Join a group of activists, organizers, and revolutionaries to discuss the meaning of The Hunger Games to the class struggle in America. What does the popularity of this book and movie series tell us about the popular imagination? How is it read and understood by young people about to enter the job market with little hope of success? Think ahead to what an American revolution could look like, what do we make of Katniss’s struggle against not only the unjust class society she inhabits, but the authoritarian alternative that calls itself the revolution? Join activists, authors and revolutionaries John Garvey, Jasmine Gibson, Jarrod Shanahan and Yuko Tonohira for a discussion moderated by Jocelyn Cohn and sponsored by Unity and Struggle and Insurgent Notes. Bring questions and points for discussion. Donate money if you want.